The MCC Bookkeeper Webinar Series has been established to provide continuing education and assistance to bookkeepers with their MCC-related tasks. Bookkeepers will receive an email two weeks before the next scheduled webinar with information on the topic and a link to RSVP. Webinars will be conducted by an MCC staff member and will typically last 45 minutes, with time for participants to ask questions. If you are unfamiliar with the concept of a webinar, please read “What is a Webinar?” to learn more. You may also wish to join a test meeting to make sure your computer is ready for a webinar. Should bookkeepers have questions, suggestions for a webinar topic, or would like to request technical assistance from MCC IT staff prior to a webinar, contact support@micatholic.org, or call us at (800) 395-5565. 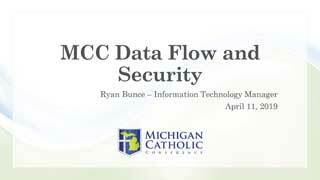 Led by MCC’s Information and Technology Manager Ryan Bunce, this webinar provides an overview of how information moves between bookkeepers, MCC, and its service vendors, as well as what practices and policies are employed to protect that data. Note: Due to the sensitive nature of this presentation, MCC has chosen not to post the webinar online for public view. Bookkeepers or diocesan staff interested in viewing the presentation are encouraged to email the MCC Information Technology department at support@micatholic.org. Paycor’s Custom Fields are the subject for this third presentation in MCC’s Webinar series. The discussion is led by Heather Murphy, MCC System Administrator. Led by Isabel Hershey, MCC Assistant Benefits Manager, this webinar provides an overview of the MCC Bookkeepers’ Toolkit. The first entry in our MCC Bookkeeper Webinar Series covers information on Open Enrollment for the 2019 Benefit Year and is presented by Mary Beth Morgan, Benefits Manager at Michigan Catholic Conference.